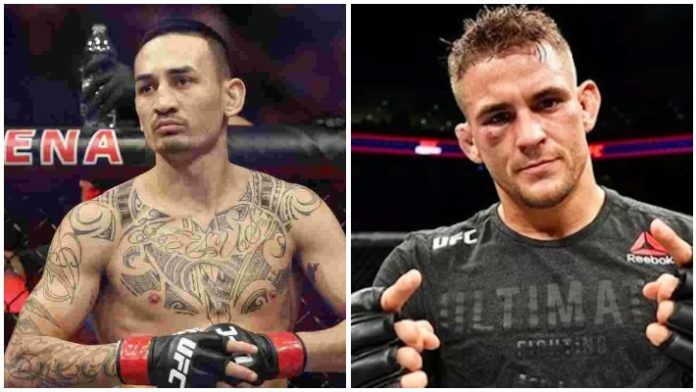 An interim lightweight champion will be crowned with featherweight champion Max Holloway moving up to 155 pounds to face Dustin Poirier at UFC 236 on April 13 in Atlanta. UFC president Dana White announced the fight via ESPN with additional sources close to the fighters confirming the matchup on Friday. The fight between Holloway and Poirier came together as the UFC looked to book an interim title bout with current champion Khabib Nurmagomedov expected to sit out until at least October. Nurmagomedov was suspended nine months by the Nevada Athletic Commission for his role in a post fight brawl at UFC 229 but he later said he would sit out for a full year in solidarity with his teammates who faced a 12 month sanction for their involvement. That left the UFC looking to book an interim title fight in the division. White added that the fight was initially offered to Tony Ferguson but he turned down the matchup. Ferguson was previously crowned interim champion in 2017 and then stripped of the title a few months later when he suffered an injury ahead of UFC 223 when he was expected to face Nurmagomedov in the main event. With Ferguson out, the UFC turned to Poirier, who has been anxiously awaiting a fight for months after several high profile wins in a row including stoppages against former champions Anthony Pettis and Eddie Alvarez as well as a TKO against Justin Gaethje last year. Now Poirier will compete for the interim title against Holloway, who moves up from 145 pounds with an opportunity to become a two-division champion while also avenging a prior defeat. Holloway fell to Poirier in his UFC debut back in 2012 when both fighters were competing at featherweight. This time they’ll meet with the interim lightweight championship on the line at UFC 236. Holloway vs. Poirier will headline the card with another interim title fight between Kelvin Gastelum and Israel Adesanya in the middleweight division serving as the co-main event.